The Pantheon, St. Peter's Basilica, the Spanish Steps, and the Trevi Fountain are among the most impressive sites in Rome, but reaching them on foot in one day is a challenge. 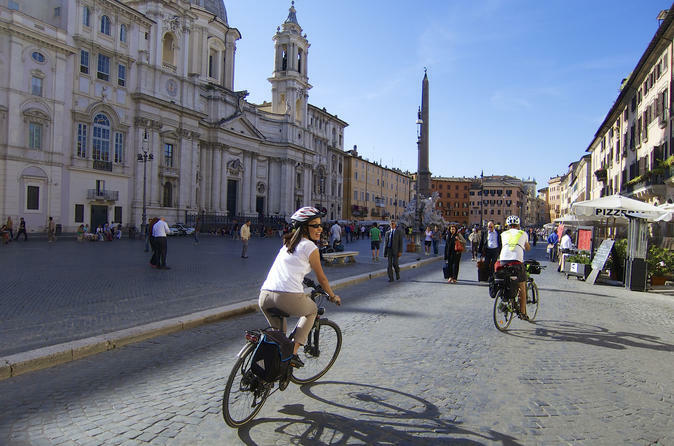 This adventurous 7-hour cycling tours lets you cover the ground with ease, and takes in ancient squares including Piazza del Popolo and Piazza di Spagna. Spin over the Tiber River to Trastevere, stop for lunch in a traditional Italian restaurant, and enjoy personal attention from your guide on this small-group tour — limited to 12 people. Meet your guide at 10am near the Colosseum in central Rome and choose an electric-assist bike or a high-quality trekking bike. Then, hop into the saddle and peddle into the city to begin your 7-hour tour. Spin through the Imperial Forum to bustling squares including Piazza del Popolo, Piazza di Spagna, and Piazza Venezia, and listen as your guide brings Rome’s colorful history to life. Along the way, discover top attractions including the Pantheon, the Spanish Steps, the Trevi Fountain, and the Villa Borghese. Admire panoramic views over the rooftops of Rome from Pincian Hill, then cross the Tiber River to Trastevere — where winding alleys hold the hidden secrets of ancient Rome. During your tour, stop for lunch in a traditional restaurant and relax over your meal in true Italian style. Marvel at the Renaissance architecture of St. Peter's Basilica — widely considered among Rome’s most important landmarks — and spin through the Jewish Ghetto to the ancient Theater of Marcellus. Then, take in the Capitoline Hill on route back to your starting point in central Rome where your tour will come to an end.